Firestone 45 mil EPDM pond liner is the industry standard for 45 mil EPDM, and for good reason. Firestone 45 mil EPDM Pond Liner is specially formulated for water gardens and Custom Koi ponds. It contains no algaecides & fire retardants found in roofing EPDM. A 20 x 20 liner will make a pond 14 x 14 pond 2 feet deep with a 1 foot over hang to put your rocks around your custom pond. Weighs approx. 120 lbs. A 20 x 25 liner will make a pond 14 x 19 pond 2 feet deep with a 1 foot over hang to put your rocks around your custom pond. Weighs approx. 147 lbs. 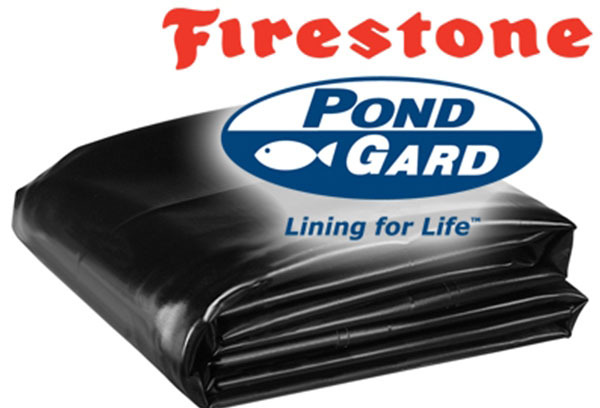 A leader in Pond Supplies – A Leading Supplier of Pond Liners by Firestone for Your pond!